The Next Generation Panafax UF-8200 multifunction fax station comes equipped with all the features that every office needs. With built-in Network scanning and Internet Fax capabilities users can easily convert paper documents into electronic files, as well as send them to any Internet Fax capable device or Email address anywhere in the world. 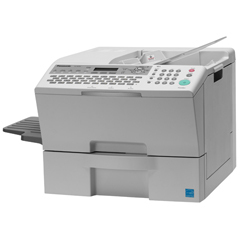 With user friendly features like the QWERTY keyboard for easy station programming, Backlit LCD display, 10,000 page all-in-one toner cartridge, large easy to pull out paper draw and advanced network device management software you can rest assured the Panafax UF-8200 will not be the bottleneck in your office.